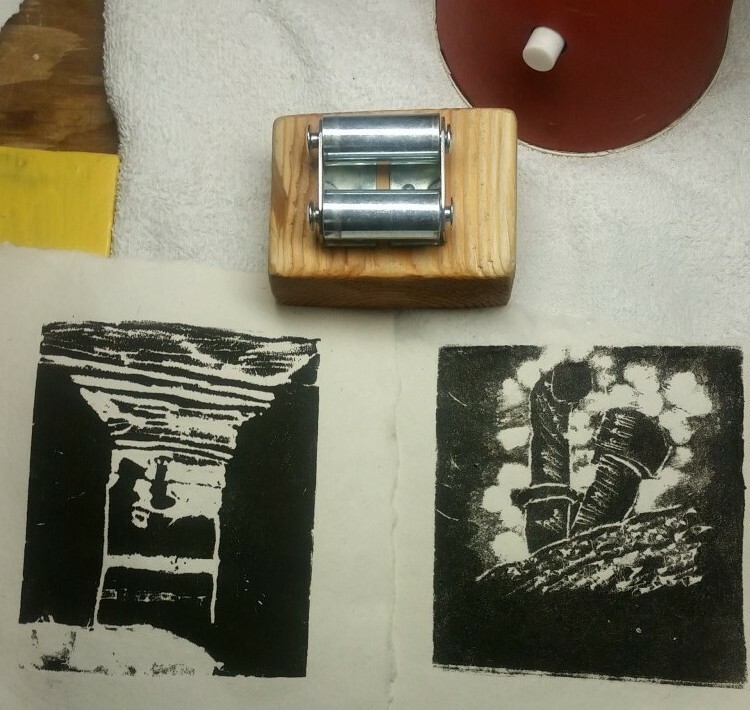 It presses etchings, but how about Styrofoam Printmaking? Artist/Printmaker Brad Schwartz wanted to know how my press works with styrofoam printmaking. I have been using this press for etchings, and an occasional small woodcut, so I had to try it out in order to answer his question. Using styrofoam plates is a popular printmaking method for schools and other often press-less places. Usually, a line based images is drawn onto the plate using a pencil or chopstick, and then the plate is dipped or painted with tempera paint and the pressed on paper. The results aren’t half bad! But, let’s take it to the next level. I went hunting around the house for some Styrofoam and found some in my studio (of course) in the form of an egg carton. I cut 2 roughly 4″ x 6″ plates and got to work. My first plate portrays an alley scene. I drew the image onto paper with pencil, then set my paper on top of my plate, transferring the drawing by quickly covering the backside of the paper with the graphite. This is a great printmaking tip for keeping your final masterpiece facing the way it was intended. the ground.For my second plate, I just drew the image directly onto the plate. I created tones by quickly sketching over the bottom area with a etching needle, and pulling away a layer of Styrofoam behind the vents in the top of the plate. The first print received the perfect storm of printmaking set up- the paper was soaked a good 5 or 10 minutes, and laid on the plate before the ink had dried out. Also, I pressed lightly, so that it didn’t feel like I was pressing the foam into the platen. This turned out to be the best touch. The next 2 prints I pressed too hard. It turns out you should just firmly roll the press across without really pressing down. More like a baren, but oh so much faster. If you don’t get enough ink transfer, you’re safe setting the paper back down and rolling back on forth over the felt with these prints. Just hold the felt in place with your hand when you press backwards.